Etching by Antonio Fantuzzi, 28.4 x 40.7 L (London, 1851-2-8-115). Heinecken, IV, 1790, 532, as Leon Daven after Rosso. Bartsch, XVI, 1818, 347, 24, as Fantuzzi (Bartsch states that a second state of this print bears Fantuzzi’s monogram at the upper right, but this monogram is written in ink on an impression in Vienna and is not etched on any impression). Herbet, II, 1896, 279 (1969, 75), 31, as Fantuzzi. Zerner, 1969, A.F.28 (Paris, Ed 8b Rés.) as probably 1543. COLLECTIONS: London, 1851-2-8-115 IMP. SIZE (inscribed in ink at lower left: 2.tab. peint par me Roux dans la galerie de Fontainebleau); W3-124. Paris, Ba 12 (very slightly trimmed at the bottom); Eb 14d (two impressions, one in red-brown ink); Ed 8b Rés., no. 134. Vienna, It.III.3, p.23 (Fantuzzi’s monogram written in ink at upper right); H.B.IV., p.44 middle (in red ink, damaged upper right). Mariette, Abécédario, 1858-1859, 23, by an anonymous etcher after Rosso, printed in red ink. Kusenberg, 1931, 164, Pl. XLV (Paris, Ed 8b Rés.). Panofsky, 1958, 127, 128, Fig. 16 (Paris, Ed 8b Rés. ), 168, n. 30. Zerner, 1964, 75, as 1543. Zerner, 1972, 113, Fig. 165. Béguin, in EdF, 1972, 264, Fig. (Paris, Ed 8b Rés. ), 335, no. 311 bis, as probably 1542. Zerner, IB, 33, 1979, 244 (London). Borea, 1980, 258, no. 658 (Paris, Ed 8b Rés). K. Wilson-Chevalier, in Fontainebleau, 1985, 53-55, no. 16 (Paris, Ba 12). Marianne Grivel, in Ronsard, 1985, 107, no. 137 (Paris, Eb 14d), as not showing the features of Francis I.
Carroll, 1987, 272-274, no. 86, with Fig. (Paris, Ba 12). Béguin, 1989, 831, and Fig. 22 (Paris), as related to the East Wall of the Gallery of Francis I.
Wilson-Chevalier, 1993, 34-35, Fig. 1 (Paris). 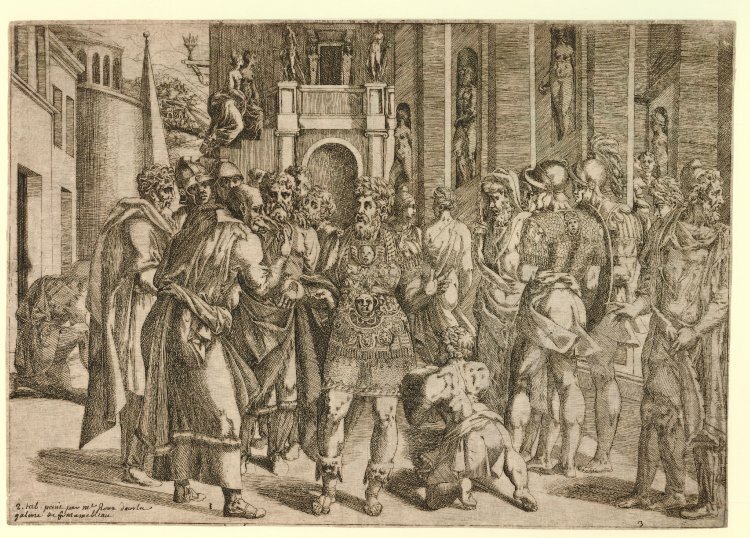 This etching is in the opposite direction of Rosso’s painting in the Gallery of Francis I (Fig.P.22, VI S a), and differs from it in a considerable number of details, which are specified in the catalogue entry of the gallery (P.22, VI S). 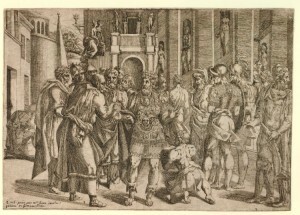 The print is not based on this fresco, nor on the lost original of a copy of a drawing by Rosso in the Louvre (Fig.D.55a), nor on the tapestry of this part of the gallery in Vienna (Fig.P.22, VI S,Tapestry, a). 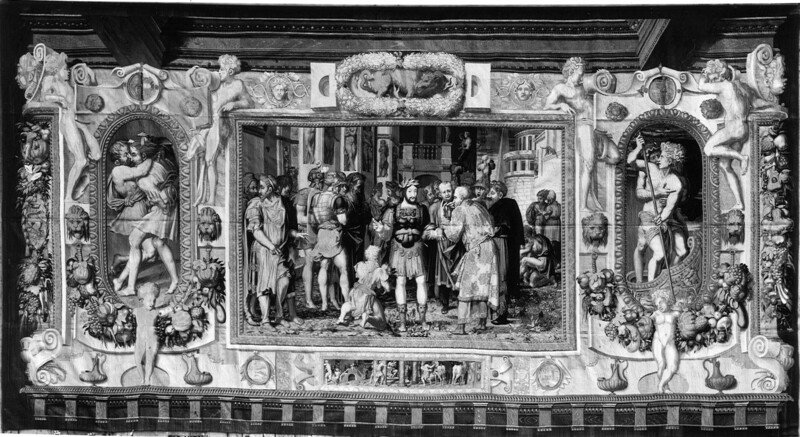 However, the etching does have one detail that appears in the tapestry but not in the fresco or the Louvre drawing: the lantern that projects from the side of the building in the background at the upper left. 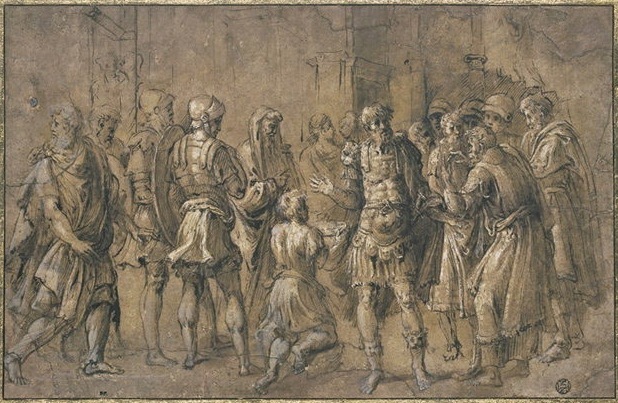 Fantuzzi’s print was probably based on a lost drawing by Rosso that was also known to the artists who made the tapestry cartoons. 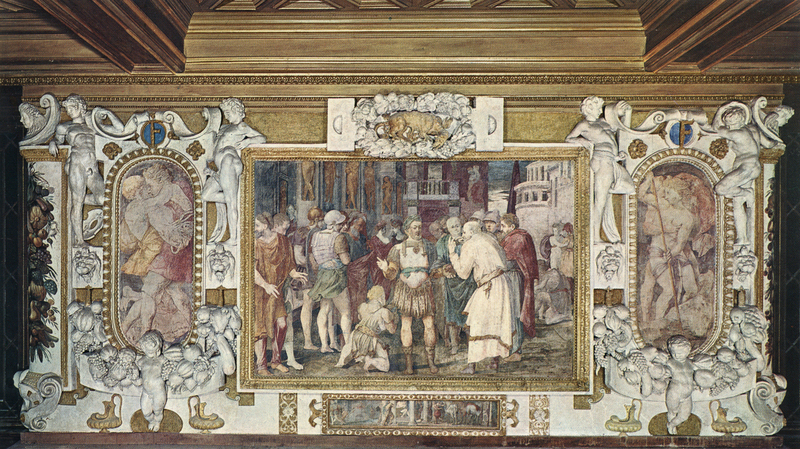 In a few details, such as in the head of the central figure, which is not Francis I’s as in the fresco and in the tapestry, his elaborately decorated costume, the detailed upper part of the costume of the helmeted warrior at the right, and the hair and beard of the man looking straight out to the left of the central figure, who in the painting and tapestry is bald or nearly bald and beardless, one may have to recognize the embellishing hand of Fantuzzi.